Seasonal allergies are flaring up all over the country – especially here in the Carolinas where we live. People are constantly asking me what they can do to treat their symptoms. That’s just it, don’t just treat the symptoms…get to the root! Over-the-counter medications only provide temporary relief and don’t help eliminate the allergen. While itchy eyes, sneezing, and runny nose can drive a sane person crazy, those symptoms are just the result of a deeper issue. You are probably thinking it’s so much easier to just kick out the symptom with an over-the-counter medication, like Zyrtec, or even a prescription, but let me try to help you understand allergies a little better. When you understand allergies from the inside out, treating them naturally can make a lot more sense. 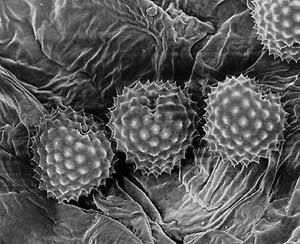 Let’s look at pollen. It looks like a spiny, miniature pinecone (See picture). Think about those prickly attackers entering your nasal passages and latching onto soft mucous membranes. 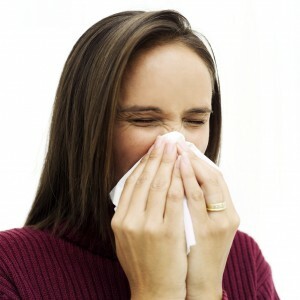 Mucous membranes line our bronchial and nasal passages and contain immune cells, which contain histamines. Receptors sit on top of immune cells, and when an allergen trigger, such as pollen, lands on top of the receptor, it signals the immune cells, which then respond by releasing histamine and other chemicals. When the histamine is released it starts a chain of reactions intended to help the body flush out the intruder and this is when sneezing, watery and itchy eyes and body itching occur. The reaction can also include swelling in the bronchial tubes, making it difficult to breathe especially for those with asthma. Raw, Local Honey – This type of honey contains the pollen from the area you live in and will create immunity within your body to that type of pollen. You can find local honey at localharvest.org. Remove Foods that Cause Inflammation – Sugar, dairy, wheat, bad fats, preservatives, artificial colors…all of these provide inflammation. Add foods that help fight inflammation…we’ll get to that in a minute! Quercetin – Helps stabilize immune cells and prevents them from releasing histamine. You can find it in fruits, onions, apples, parsley, tea, tomatoes, broccoli, lettuce and wine, but allergy sufferers will most likely need to use supplements to build up enough of this compound to prevent attacks. It’s recommended to start with a dosage of about 1,000 milligrams a day, taken between meals, six weeks before allergy season. If you’re pregnant, nursing, or have liver disease consult with your doctor before using quercetin. Allergy-Fighting Foods – Omega -3 fatty acids help fight inflammation. You can find omega-3s in cold-water fish like wild salmon, walnuts and flaxseed oil, grass-fed meat and free-range eggs. Spicy foods can also help keep airways clear by acting as a natural decongestant, so consider adding chili peppers, cayenne pepper, or horseradish to your food. AlfAlfa + Immunity – This combination of supplements has been used by several of my close friends who have been long term allergy sufferers. They swear by it! Alfalfa is a natural detoxifier, therefore it helps rid the body of the pollen. You can find these supplements at bthealthsource.myshaklee.com. Chiropractic Adjustments – Damage to your spine will prevent your body from healing properly. When a nerve is pinched it doesn’t allow the organs to heal as they should and in the case of allergies, can prevent your immune system from functioning like it should. I noticed in your list of categories, you do not have one specifically for Diabetics. Do you have any recipes that stay away from raw sugars? I’m finding it difficult to convert regular recipes into diabetic meals and sweets. lease help me if you can. Thank you for your time and effort, I really do appreciate anything you can give me….Need to learn how to cook all over again. I’m so glad that you’re finding our site to be helpful. Many of our salad recipes are suitable for diabetics, but we do use raw, natural sweeteners for many of our treats.